Left to right: Pat Tyler, JuanitaMartin, Gil Mansergh, Jennie Butler, Debbie Koehler, Linda McCabe, Deborah Taylor-French, Ana Manwaring. Photo by Rob Koslowsky. Today's blog entry is a fashion tip. It is not something I discovered by reading any magazine or newspaper column. Nope. It comes from my own personal experience of finding myself wearing the same exact outfit as three other people at a recent holiday gathering. 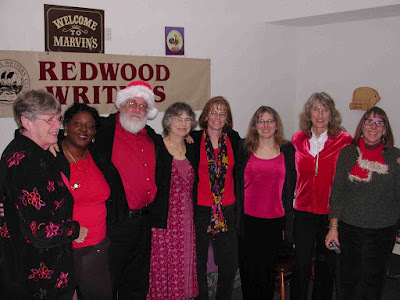 My writers club meets monthly and at our December meeting we had not only a guest speaker but a holiday celebration. So I wanted to look festive for the occasion. I looked in my closet and pulled out one of my favorite blouses. It is fuschia colored and it looks appropriate in winter. I grabbed a pair of black slacks and then, as an afterthought I paired it with a black blazer. My color scheme was black, fuschia and black. I thought it looked smart, albeit an uncomplicated look, but it worked for me. I had no idea that it would be the most popular color scheme of the day. 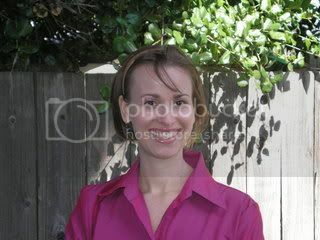 Once I got past that temporary mental road block, I saw she was also wearing a black blazer, red shirt, and black slacks. Then I looked at Gil Mansergh and he was wearing the same color combination as well. Then there were others wearing red and black so we had a group photo taken. This is the second meeting in a row that Gil and I have dressed alike. In November we both wore camel colored blazers. I hardly ever wear that blazer, and yet that day I did. We looked like twins. Seriously, we had a wonderful meeting and we were fortunate enough to have the lovely and talented Jordan Rosenfeld come and speak with us again. This time she had a brand spanking new book to sell and sign. We were in fact her second stop on her book launch. She talked about her book and the various ingredients you need to create a good dramatic scene. While all of those things are important and I shall read her book once the crazy holiday season is over, I enjoyed her discussing how the book came to be. Jordan has an MFA in Fiction and Literature and has yet to get any of her novels published. Yet, she has written many articles which have been published about the craft of writing in Writers Digest. She joked about that, but it is what helped get her the book contract. Jordan was a known commodity to the editors because she had worked with them successfully in the past with articles. Jordan came up the concept for the book after having worked as a freelance editor for several years and noting similar problems in many different manuscripts. She noticed that many writers found it difficult to create the integral building block of drama, otherwise known as "the scene." She looked through the large catalog of book titles that Writers Digest offered and she did not see one that addressed this topic. She pitched them the idea. They liked it and then she put forth a proposal which they accepted. Then all she had to do was write the book. The old advice of "know your market" is something that Jordan's success story exemplified. She did not just send random queries out for an idea she thought up over breakfast. She identified a niche, she did her research, articulated her idea well, and had established her expertise and credibility with the publisher. That is how you become successful. You need to know the industry, find your creative niche, and be professional every step of the way. Linda, thanks for the summary! It was so much fun. I would like to make a correction, though. The editors of Writer's Digest magazine and those for the publisher are two different sets entirely who don't work in the same building, much less know each other very well. I only had credibility with the publisher in that they knew I could take an assignment and finish it, but I was not a known commodity to the editors at the publishing house one bit. This is to say that persistence and, as you point out, knowing your niche and market and researching it, are MORE important than being known...! Thank you for the correction. That was a large assumption on my part. I should have verified things with you before I posted it, but I was in a hurry since I had finally found some time to write that blog post and I jumped to conclusions. I would hope that the editors at the publishing house for the Writers Digest Books would at least be regular readers of the Writers Digest Magazine. So even if they hadn't worked with you in the process of editing your articles, they should at least have been familiar with your work. I would also think they would be predisposed to look kindly to a proposal from a writer with credits from a sister publication. Then again, they could always pick up the phone and call their sister colleagues which they probably know from social functions and ask, "so what has your experience been like working with this writer?" Another reason to always put forth a professional demeanor. Your reputation will precede you. Do what you can to make sure it is a good one.